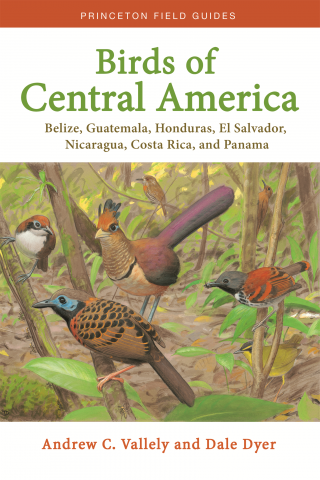 A very exciting field guide was published by Princeton University Press in October last year: Birds of Central America: Belize, Guatemala, Honduras, El Salvador, Nicaragua, Costa Rica, and Panama(2018), written by Andrew C. Vallely and illustrated by Dale Dyer. This much-needed field guide describes and illustrates the more than 1200 bird species of Central America and most of the important subspecies or subspecies groups, and it does so with such an unprecedentedly high quality that it will easily become the new standard reference in the region. Central America has been a very popular destination among birdwatchers for decades, because of the high diversity in bird species in a relatively small and easy-to-bird area. Central America’s land mass only occupies half a percent of the surface of the planet but hosts 12,5% of the bird species on Earth, and more than a hundred of them are endemic. It is the ideal place for birders who are new to the Neotropics to get familiar with birding in the region, because Central America has members of almost all the common Neotropical bird families, while at the same time a lot of North American migrants, a few South American visitors and even some unique families can be quite easily found. This guide is the perfect starting point when planning a birding trip to the region, and the ideal travel companion during such a trip. Vallely and Dyer began working on this project exactly ten years ago. At that time, I did my first birding trip through all the countries of Central America, and I remember having to carry four guides with me: one for Belize, one for Northern Central America (NCA), one for Costa Rica and one for Panama. If only I had 1,3 kg in my backpack instead!Birds of Central Americawas worth the wait, surpassed any expectations, and I am already excited to go back to Central America again, equipped with this new ally. Even though there were great books available for the birds of Belize, Costa Rica and Panama independently, and multiple options existed for NCA as a subregion, this guide is the first to integrate the whole region with clarity and precision. The only previous attempt to do this, and to even include Mexico, was Ber van Perlo’s Birds of Mexico and Central America(Princeton, 2006), which may now be used as a complementary illustrated checklist, because the quality of the texts and illustrations is nowhere near Vallely and Dyer’s brand-new field guide. So, what do we find in the book? The introduction gives an excellent explanation of how to use the species accounts and provides the birder with useful general information on birdwatching in Central America, with a separate section dedicated to the region’s specific biogeography. One remark on the use of the species accounts is that the term ‘habit’ might be a bit confusing at first. The habit section primarily focuses on the habitat types in which a species is expected, and only then its behaviour is described. This is the reason why the Central American habitat types are explained in the form of a glossary table in the habit section of the introduction. A few extra illustrations of the typical habitat types could have been included here to give newcomers to the region an impression of what, for example, thorn forest, elfin forest or paramo looks like. Next, in the geography section, these habitat types are placed in the broader context of Central America’s biogeographical subregions, so that the birder knows where to find them. The descriptions are always linked to the avifauna that can be encountered in a subregion and some typical or range-restricted species are given as examples. Maybe the Panama Canal area, which is the meeting point of North American and South American (sub)species and thus one of the most diverse areas of the whole region, could have been mentioned and described separately instead of being included in the section on East Panamanian lowlands and foothills. The guide uses three range maps: one for the entire region, one for Northern Central America (zoomed in to Belize, Guatemala, El Salvador, Honduras and north-western Nicaragua) and one for Southern Central America (zoomed in to southern Nicaragua, Costa Rica and Panama). This is a logical choice, because specialties of Northern Central America rarely reach eastern Honduras, and Costa Rica and Panama share a lot of endemics that rarely reach Nicaragua. For range-restricted Central American endemics such as Goldman’s Warbler, Horned Guan, Honduran Emerald, Nicaraguan Grackle, and Black-cheeked Ant-Tanager, the distribution pattern might have been depicted more precisely using a map that is even more zoomed in to the exact area, but the authors must have thought that such highly local species are too few to make any exceptions. The range maps are easy to understand, with residents depicted in dark green shading, breeding visitors in lighter green, winter residents in brown, and transients in light brown. Historical records are indicated with a green asterisk, vagrants with a black star and species of hypothetical occurrence with a question mark. The abundance categories of the species in the region are adapted to the likelihood of encountering them in the field and range from abundant to very rare. The field guide uses the taxonomy of the American Ornithologists’ Union (AOU), which is a logical choice since Central America is mainly birded by Americans. For European birders who are not familiar with this taxonomy, it may seem somewhat conservative if compared, for example, to the taxonomy of the International Ornithologists’ Union (formerly known as International Ornithologists’ Committee) or the even more progressive taxonomy used in the Handbook of the Birds of the World. The authors have made a few straightforward taxonomical decisions that differ from AOU taxonomy. Notes on taxonomy are indicated with numbers in superscript right after some of the species names and can be found in the back of the book. Differences in nomenclature may result from different spelling between the US and the UK (‘gray’ versus ‘grey’), the use of different names in the US and the UK (Eared Grebe versus Black-necked Grebe; Sparkling-tailed Hummingbird versus Sparkling-tailed Woodstar; or Bank Swallow versus Sand Martin) or a different taxonomical treatment of species and subspecies (Barn Owl versus American Barn Owl; Herring Gull versus American Herring Gull; Northern Pygmy Owl versus Mountain Pygmy Owl; Black-faced Antthrush versus Mayan Antthrush; and so on). European birders will simply have to adapt to the AOU here. I stumbled upon three spelling mistakes in the English names: “Violaceous Dove” on page 63 should have been Violaceous Quail-Dove, “Chuck-wills’-widow” on page 79 should be spelled as Chuck-will’s-widow, and the Hoffmann’s Woodpecker is misspelled as “Hoffman’s Woodpecker” on pages 266-7. A lot of studies on avian populations and subspecies are still in process and new finds will probably result in splits and/or lumps of species in the future. It is extremely helpful that all the relevant subspecies or subspecies groups have been succinctly described in the sections called GV (Geographical Variation) and are also brilliantly and orderly illustrated, so that there will be no problem with (sub)species identification if nomenclature changes. Put in other words, the book is a valuable investment with which you will acquire timeless access to high-quality information on every bird population in Central America. Vallely’s descriptions are concise and on point. The phrase ‘CA endemic’ is put at the beginning of every description of an endemic species to make the reader aware that it is a species of interest in the region. For every species, there is information on its distribution, general appearance, geographical variation in appearance, habitat, habits and voice. The most important field marks are highlighted in italics, which makes accurate identification easy. The voice sections are also very good and frequently hint the reader at similar or comparable sounds of other species. The only opportunity that this field guide missed is to connect the texts more to the colour plates by including pointers or brief captions next to the illustrations that highlight the most useful field marks for every species or subspecies. Instead of quickly being guided by such pointers, the reader is now left on his or her own to interpret the texts and look for the differences between the illustrations. A lot of field guides use this visual aid and birdwatchers generally appreciate not having to read a full text when in the field. There is quite a lot of space left on many of the illustration pages, which could have been used for this purpose. This said, Dale Dyer’s illustrations are so mind-blowing that they are the definite highlight of this guide! These first-rate bird drawings make it one of the best field guides I have ever seen (and in more than 20 years of birding and collecting field guides I may say that I have seen quite a few). What is also special about this book is that all the drawings are made by the same illustrator, so there is no distracting mix of drawing styles. The illustrations are very big, which makes it easy to seeall the necessary details of each illustration. In the upper right corner of every plate, the exact scales of the drawings are given in percentages. The proportions, colours and shadowing effects that Dyer uses are simply so terrific that the drawings almost come to life and seem to jump off from the pages as if they were three-dimensional birds. I have not found a single drawing that did not convince me. Just to mention a few, the kingfishers and woodpeckers almost look real, the hummingbirds and trogons are illustrated with vibrantly green colours, and the manakins, orioles, tanagers and warblers are so charming and colourful that the book is a must-have for any fan of field guide art. At first sight, some of the illustrations may seem somewhat paler than commonly seen in other field guides. This is probably an effect of the background colour of the plates, which is not pure white but light-grey, grey-brown, grey-green and creamy-brown, depending on the genus depicted. These choices make a lot of sense and help to perceive the birds as if they were encountered in their natural habitat and light conditions. Another fact is that Dyer uses a wide variety of tones, with black not just being black but a combination of all kinds of greys and iridescent blues, greens and purples, for example. His incredible drawing skills are especially apparent in the ability to perfectly portray cryptic birds like owls and nightjars, plain-brown species like thrushes, woodcreepers and foliage-gleaners, or dull olive-green and greyish-white species like tyrannulets and vireos, without a single colour tone being off-key. The sometimes very subtle differences between the most important subspecies or subspecies groups in the region are all brilliantly illustrated too. One thing else to mention about the species accounts and colour plates is that aberrations in plumages such as leucism or melanism are not mentioned anywhere in the guide. One extra page could have been dedicated to depicting, or at least describing or mentioning some of the common plumage aberrations, simply to make a starting birdwatcher aware that such phenomena exist and can interfere with identification. Also, only very few hybridizations among species are depicted, and some frequent hybrids are not mentioned (for example between ducks, warblers or local species like Blue-tailed and Berylline Hummingbird in West Guatemala). Some domestic or feral types of birds are not considered either (i.e. Domestic Mallard, Domestic Muscovy Duck, Domestic geese species). Per country or subregion, the best field guides are: H. Lee Jones’s Birds of Belize (2004) with illustrations by Dana Gardner; the Peterson Field Guide to Birds of Northern Central America (2016), written by Jesse Fagan and Oliver Komar and illustrated by Robert Dean and Peter Burke, which covers Belize, Guatemala, El Salvador and Honduras; Birds of Nicaragua: A Field Guide(2018), in which the same Robert Dean collaborated with Liliana Chavarría-Duriaux and David C. Hille;The Birds of Costa Rica: A Field Guide(2007; 2014) by Richard Garrigues and, again, with Dean’s illustrations; and The Birds of Panama: A Field Guide (2010), written by George R. Angehr and illustrated once more by Robert Dean. The illustrations in these field guides are good overall, though sometimes a bit simple, and on a few occasions even too confusing to properly identify similar species. The guide to the birds of NCA is the only one giving proper attention to subspecies or subspecies groups, and has more drawings per species than, for example, the one for Costa Rica. It may also have the best descriptions out of all these field guides. In the other ones, some of the descriptions are a bit short and there is hardly any attention given to geographic variation. Advantages of using these guides may be that they are compact and that the information and range maps are limited to one country or a smaller region. On the other hand, there is a lot of overlap among species in the tiny countries of Central America and for birding purposes it is best to have a nice overview of the whole region in one guide and one style. Even if you are travelling to only one of these countries, it is useful to have knowledge of all the birds of the region and to be able to quickly compare similar species. While the other guides mentioned above all have high quality and are still fresh, Birds of Central America is like a combination of all of them in one book that has even more information and better illustrations to offer. My prediction is that this masterpiece will become the standard field guide for Central America for at least the upcoming decade, and probably even longer, as it will be very hard for any author and illustrator to compete with it in the future. We will have to keep an eye on Dyer’s work, because his next step will likely be to illustrate a field guide to the birds of Mexico, one of the last regions in the Americas that is still in urgent need of a thorough and up-to-date field guide. For now, we are lucky to have such a guide for Central America. Ik ben voor dit gebied helemaal blanco, vond de recensie zeer aanstekelijk en nu ligt dat imposante werk op het nachtkastje. Wat een prestatie van 1 enkele tekenaar! En van de tekstschrijvers natuurlijk. John: ik had in mijn eerste reactie nog willen zeggen dat de gids qua tekenstijl goed aansloot op Sibley en Howell & Webb. De overlap in noordelijk C-Am vind ik geen probleem. In elk geval hoeft de licht-suïcidale vogelaar die Honduras bezoekt nu maar één boek mee te nemen. Aanstekelijke recensie! Wel mis ik in het rijtje voorgangers nog Howell & Webb's Guide to the birds of Mexico and Northern Central America. Heel degelijk (en 1.6 kg), met uitgebreide beschrijvingen en bijna altijd meerdere kleden per soort. De afbeeldingen (alle van Webb) zijn heel duidelijk. In die gids is niet gekozen voor een begrenzing tot landen maar voor een biogeografische eenheid, en inderdaad overlapt het zuiden van Mexico natuurlijk sterk met Guatemala en Belize. Een soortgelijke gids voor Panama, Costa Rica en het op Howell & Webb aansluitende deel van Nicaragua zou mooi complementair zijn geweest. Die verdraaide koekoek heb ik al afgeplakt! Alleen al de voorpagina bezorgt mij enorme vreugde en de hik!! De tekeningen zijn inderdaad heel fraai. Van mij mogen ze alleen wel wat scherper (zoals Guy Tudor, aan wie Dyer het boek opdraagt, dat deed). Fijn om een modern ingedeelde gids voor Midden-Amerika te hebben. Dat is een hele vooruitgang ten opzichte van het doolhof dat Birds of Panama (with Costa Rica, Nicaragua & Honduras) je voorschotelt! Helaas schrijft niemand een veldgids zo leuk als Ridgely. De gidsen voor Costa Rica heb ik nooit aangeschaft (de oude was op een gegeven moment niet meer te vinden en de nieuwe sprak me niet aan): dat is nu helemaal niet meer nodig.